Any time anyone talks about peace among the three main monotheistic religions, they are always referred to as the “children of Abraham”. And yet the tomb of the Patriarch that is common to Jews, Christians and Muslims continues to be the catalyst of hatred and conflict between these religions. Tensions are running high again in Hebron, the Holy Land city which is home the Tomb of Patriarchs. The Tomb – which is believed to be Abraham’s burial place – has been a place of worship for some millennia. What sparked the tensions was the murder of Sergent Gal Kobi, an Israeli soldier who was shot by a sniper, near the site which is known to the Jews as the me'arat ha-Machpela (The Cave of Machpelah) and to the Muslims as the al-masjid al-Ibrāhīmī (the Sanctuary of Abraham). The murder took place just as Israel celebrates the Feast of Tabernacles or Sukkot. The soldier was escorting some Jews who had gone to pray at the site which is situated inside Palestinian territory. Not surprisingly, the Israeli army responded with a series of stops and searches in an attempt to find the sniper who fired the shot. But the toughest reaction came from the political sphere: Israeli Prime Minister Benjamin Netanyahu has authorised the entry of Jews to Machpelah House, which is located near the contested holy site. Last year, a Jewish organisation purchased Machpelah House through some intermediaries. Before this, they had been forbidden from moving into the building in order to prevent further tensions in a city that is home to 200 thousand Palestinians. 7 thousand Israelis live in a high security part of Hebron’s Old City. The Tomb of Patriarchs has been divided by a pane of bulletproof glass to allow each religious community to pray at the tomb of Abraham separately. 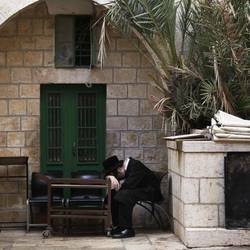 Hebron’s history is a perfect illustration of the Israeli-Palestinian conflict. The Tomb of Patriarchs occupies a hugely important place in Jewish history. As the Book of Genesis says, the Cave of Machpelah was purchased by Abraham to use a burial plot for his wife Sarah (before his own death). For this reason it is considered the earliest evidence of the Promised Land. A small community of Jews continued to lived here, alongside Muslims, even during the diaspora. This was until the 1929 pogrom, when 67 Jews from Hebron were brutally killed in the early clashes between Arab nationalists and Zionists. Britain responded with a drastic and perhaps even more traumatic decision: they moved all Jews out of Abraham’s city for security reasons. Then, in 1967, after the Six-Day War, a group of Jews decided to settle in Hebron again. But this time they had the army on their side. This marked the start of new clashes which culminated in the bloodbath of 26 February 1994, when Baruch Goldstein, a Jew, opened fire on a group of Muslims who were on their way to the Tomb of Patriarchs to pray. About 60 people died on that occasion, including the 29 people Goldstein killed and other victims of the violence which followed. The Hebron massacre of 1994 marked the first serious stop to the peace process launched a month before with the Oslo Accords signed by Rabin and Arafat. The fear therefore, is that tensions surrounding Abraham’s Tomb will yet again blow out the feeble flame of negotiations which resumed between Israelis and Palestinians just a few weeks ago.